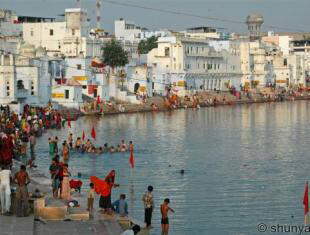 Pushkar is known as teerthraj or king of all pilgrimages. It is situated in Ajmer district of Rajasthan. Pushkar has the only temple dedicated to Lord Brahma. According to Padma Purana, Lord Brahma, the creator amongst the Hindu trinity, decided to make an offering of a fire sacrifice (Yagya) after completing the creation of the universe. In order to make this sacrificial offering, Lord Brahma wanted to identify a suitable place. He tossed a lotus bloom and the flower landed where we now find the Pushkar Lake. So, Pushkar was chosen for performing this sacred ritual. Though most people know of only one Pushkar, there are in fact three Pushkars. All of them are in Ajmer. It is believed that while the lotus bloom itself landed in the Pushkar Lake, the two leaves that came with the stem of the lotus fell at two other lakes. One of them is called Bhuda Pushkar and the other one is called Madhya Pushkar. Villagers who live around Bhuda Pushkar and Madhya Pushkar believe that those are the real Pushkars. When all the preparations for his great yagya were complete, Brahma's consort Savitri failed to join him. In order to complete the ritual, he married a local gujjar girl called Gayatri and proceeded with the yagya. When Savitri arrived, she was furious to see Gayatri beside Lord Brahma. Since Lord Brahma did not wait for Savitri for this great sacrificial offering, she felt bad and she told Lord Brahma that Pushkar is the only place where he would be worshipped in this world. That explains why we have only one Brahma temple whereas there are thousands and thousands of temples of Lord Shiva and Lord Vishnu. It is believed that Lord Brahma pooled water from Badrinath, Jagnnath, Rameshwaram and Dwarka to create Pushkar Lake. That is why Pushkar lake is called the teerthraj. Since Pushkar is the place where the first sacrificial offering was made by Lord Brahma and since the water in Pushkar Lake represents combination water from four important pilgrimages for the Hindus, it is considered to be as holy as the water from river ganges. It follows, therefore, that if you take a holy dip at teerthraj Pushkar Lake, you automatically become eligible for gathering the boons for visiting the other four pilgrimages.